After a second place finish at last years NCAA Division III Indoor Track and Field Championships in the heptathlon, senior Zach Anderson from Frederic, Wis. finished his indoor track career on the highest note possible by winning the event and becoming the 2014 National Champion in the heptathlon. In capturing the event title, Anderson scored a University of Wisconsin–Stout record 5334 points. Joining Anderson at the national championships were junior Patrick Jenkins of Cambridge, Wis. and freshman Nick Lubinski of Hudson, Wis., who both earned All-American honors as well. Jenkins captured his second and third overall All-American track awards with a sixth place finish in the 3000-meter run with a time of 8:18.17 and a fifth place finish in the 5000-meter run in 14:21.33. Lubinski placed eighth in the triple jump with a mark of 46 feet, 8.75 inches, earning his first All-America award. On the women’s side of things, Jessika Smith, a senior from Onalaska, Wis., and Meagan Ward, a junior from Eau Claire, Wis., both obliterated the UW–Stout school record in the pentathlon. Smith finished second with 3798 points, and Ward placed fourth with 3645 points. The 4×400-meter relay team of Smith; Ward; Jada Hamilton, a junior from Rice Lake, Wis.; and sophomores Laurisa Titterud of Lino Lakes, Minn. and Molly Brion of Cameron, Wis. narrowly missed the podium, placing ninth in the event with a time of 3:53.94. Senior Michelle Theisen from Marshfield, Wis. also had a strong showing, placing 10th in the shot put with a throw of 44 feet, 6.75 inches. The Blue Devils outdoor track and field season kicked off last weekend at the Emory Outdoor Invitational, as the men’s team finished sixth of 25 teams and the women’s team finished fourth of 25 teams. For the women, senior Cheyenne Grey from Gilmanton, Wis., captured a second place finish in the 100-meter hurdles with a time of 15.11 seconds, and Thiesen finished third in both the shot put (40 feet, 11.5 inches) and the discus (130 feet). 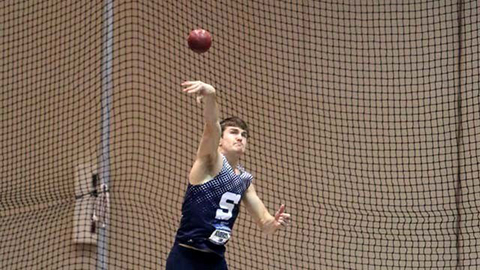 On the men’s side, freshman Sam Elsner of Pardeeville, Wis. won the discus with a toss of 159 feet, 4 inches, more than six feet farther than the next closest competitor. The 4×400 meter relay team of Anderson; freshmen Jason Vongsavanh of Jackson, Minn. and Ross Thompson of Mauston, Wis.; and junior Cody Hodowanic of Gilman, Wis. placed third with a time of 3:23.09.